Both of South Carolina's Republican U.S. senators, Sen. Lindsey Graham and Sen. Tim Scott, have said they will help Nazanin Zinouri return home to South Carolina. Following President Donald Trump's executive order on immigration, which barred entry into the U.S. from seven predominantly Muslim countries, Zinouri was taken off a flight in Dubai Friday while trying to return from visiting family in Tehran. Graham has said that he's working to get Zinouri back to South Carolina "as soon as possible," according to the Associated Press. The Associated Press reported that Graham told people at Zinouri's workplace in Clemson that she is "is exactly the type of person we want to be part of America." "She's a valid visa holder. She's paying taxes, and she's adding value to this business," he said at Modjoul, a startup technology firm where Zinouri has worked since August, according to the Associated Press. "She's intelligent. She adds value to our country, and I'll find a way to fix this problem." He tweeted that he had been in touch with Zinouri as well. 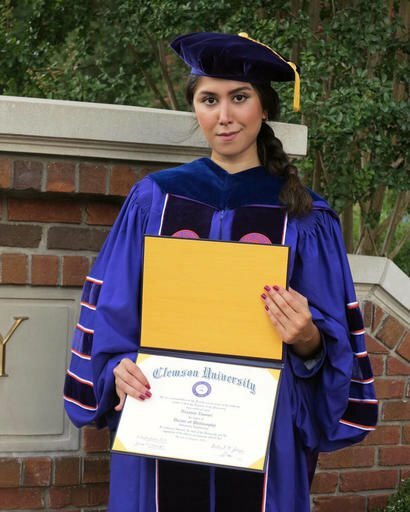 We have been in touch with and are working to assist Clemson graduate Nazanin Zinouri. South Carolina's other U.S. senator, Tim Scott, has also said in a tweet that he is working to help Zinouri. "My office continues to be in touch with Nazanin Zinouri and CBP," his tweet said. "Working to assist." My office continues to be in touch with Nazanin Zinouri and CBP. Working to assist. "I was planning on enjoying time with family and taking care of family business," Zinouri said Sunday in a phone interview with The Associated Press from Tehran. "But I've not been able to do any of them. I'm mostly just listening to the news. ... I can't really focus or enjoy anything as much as I want. I can't even have a normal conversation." Zinouri is a data scientist who lives and works in Greenville, according to a piece she wrote for the Washington Post Monday. She has lived in South Carolina since 2013, and in the U.S. since 2010. She graduated from Clemson University in August, earning a PhD in industrial engineering. Follow Brooks Brunson on Twitter @readthebrooks or ​reach her at 843-937-5433. A South Carolina resident who has been stuck in Iran following President Trump's executive order limiting travel from seven Muslim-majority countries says she "just wants to get back to a normal life" in the country she's made her home. Brooks Brunson leads The Post and Courier's digital audience team, which includes everything from the website to social media to helping shape our coverage to best serve readers. She was born and raised in S.C. and joined P&C in 2014.